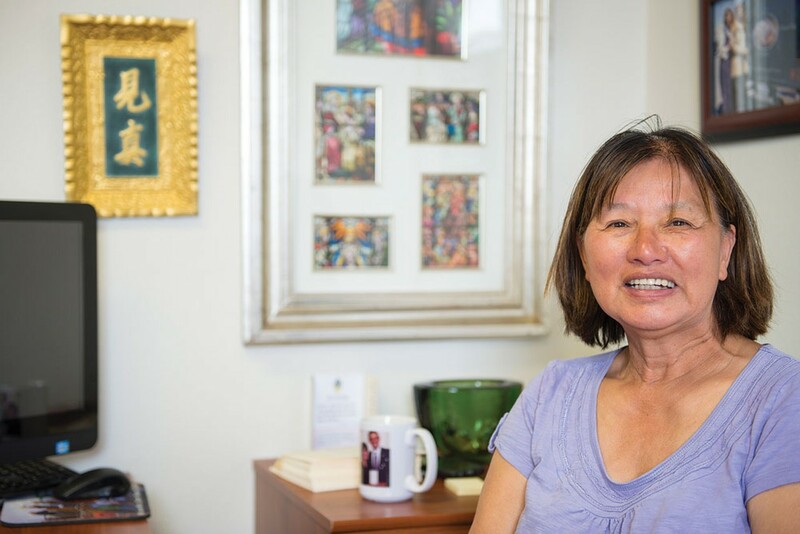 Between Blue Angel Village, her day center and a clandestine sanctuary camp she started last fall, Betty Chinn has helped house 155 people in the last 13 months. It's easy to forget that it wasn't always like this for Betty Chinn, that she didn't always have a gleaming building with her name on it or public officials singing her praises. It's easy to forget that there were many days in the not-so-distant past — before she was honored by the president of the United States and the first lady of California — when Chinn was largely unwelcome in Old Town. Sitting at a picnic table in the small village of converted Connex shipping containers that has quickly become one of the few bright spots in the weekly news coverage of local efforts to combat and manage homelessness, Betty's eyes drifted across the street, recalling a day a little more than a decade ago when she was accosted by a group of angry business owners for doling out sandwiches to the poor in the driveway of St. Vincent de Paul's Free Dining Facility. She recalled how she was harassed by the police, who saw her more as someone who enabled vagrants and criminals than as a local saint who has dedicated decades of her life to caring for Humboldt's poorest and most vulnerable residents. And it's just about impossible for anyone to understand the toll these encounters had on Chinn, who as a 7-year-old was turned out of her wealthy family's home in China's Guangdong province during Mao Zedong's Cultural Revolution. Targeted because of her parents' wealth and Christian beliefs, Chinn spent years homeless on the streets. Alone, with her mother jailed and her siblings hauled off to labor camps, she found refuge in a garbage dump and foraged for food. Mao's Red Guard forbade Chinn from speaking to people and hung a wooden sign around her neck with wire that read "child of the devil." She was ostracized and beaten, and years later would have to relearn how to speak. She lived like this for four years until — after having seen family members tortured and killed — Chinn and three of her siblings fled, hiking hundreds of miles before swimming across the Pearl River Delta to freedom in Hong Kong. With each hostile encounter with the police or a local business owner, Chinn says, images of hard-faced soldiers would flood back, leaving her consumed by feelings of isolation and fear. But for years, Chinn kept handing out sandwiches, rain ponchos and hot coffee to anyone who was hungry, wet or cold. She says she simply wanted to do for others what nobody had done for her, to help them stave off hunger pains and show them they mattered, at least to someone. "Did you ever think this would happen?" she asks, smiling in the early morning fog at the Connex housing project, which has been officially named Blue Angel Village but invites a host of nicknames, ranging from the "Chinn Bins" to "Containerville." Over the last decade, Chinn has inked an incredible new chapter to her story. 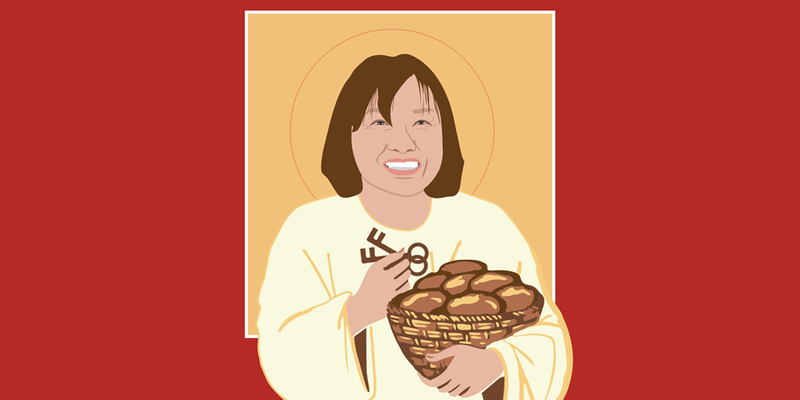 She's used the cachet of awards from then California First Lady Maria Shriver and President Barack Obama to transform the one-woman food distribution and outreach operation she ran out of her house and church kitchens. First, after a homeless man she'd befriended drowned while bathing in Humboldt Bay, she partnered to build Eureka's only public shower facility. Then she created a nonprofit that bears her name and opened the Betty Kwan Chinn Day Center, which offers everything from vocational training and parenting classes to daycare and afterschool programs. And, in a couple of weeks, she'll open her new family shelter that will take 14 homeless families off the streets and out of the bushes. But sitting at that picnic table on a recent Thursday morning, Chinn says it is in this fenced asphalt parking lot, between these old shipping containers, that she's found her passion and her true calling: working with a community of people to help them improve their lives. Four months in, the results have been noteworthy. Of the 79 people who have stayed at the 40-bed facility, 43 percent have moved into housing and 42 percent have found jobs. "It's a thriving community," says Loren Stentzel, the project's case manager. "We really turned this barren parking lot into a neighborhood." Stentzel's surroundings underscore his point. 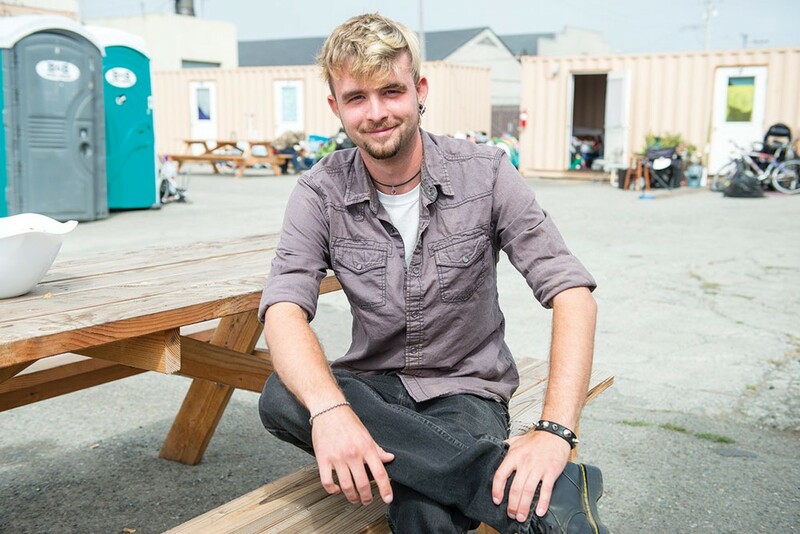 He's sitting in the temporary trailer that he and Project Manager James Rockwell use as an office, but immediately outside sits a standalone lending library built of reclaimed wood that would look at home in Lumbar Hills. Pots exploding with vibrant blooms surround the trailer, as a raised planter bed with an attached bench — also made with reclaimed redwood — beckons. A bulletin board hangs nearby with fliers for the village's new weekly women's group, the Blue Angel Village Crocheting Society, a chores list and a notice reminding of the weekly community meeting, held every Monday at 4 p.m., during which residents talk about problems and successes, issues and ideas, and what they want to watch for movie night. At the top of the board a picture of Martin Luther King Jr. is pinned with the quote, "If you can't fly, then run, if you can't run, then walk, if you can't walk, then crawl, but whatever you do, you have to keep moving forward." Below is a flier for a weekly harm reduction support group. Chinn laughs as she remembers how reticent she was to take on this project. As the city's self-imposed May 2 deadline for clearing a 200-person homeless encampment from the PalCo Marsh approached, Chinn was terrified, scared of how the eviction would go and where the displaced people would wind up afterward. But she also felt she'd done her part and was at a loss as to what to do next. Then she was approached by an unlikely partner — the Humboldt Coalition for Property Rights and its co-founder and Humboldt County Planning Commissioner Lee Ulansey. Over the course of a couple hours, Ulansey explained that he felt something had to be done and pitched his shipping container village idea to Chinn. He told her that HumCPR could handle the money part and build the village. He just needed someone to run it. A reasonable person may have said no. The climate in Eureka at the time was one of discord. People were upset about the marsh evictions, while others were upset at the prospect of providing any new services to the soon-to-be evicted. Even those calling for the city to create a kind of sanctuary campground were bitterly divided about what it should look like. "Everybody yelling and screaming," Chinn recalls. "Everybody has a million ideas but they don't do anything." And there was sure to be a fierce neighborhood backlash against the idea of moving 40 formerly homeless people into makeshift shelters in the vacant lot on Third and Commercial streets. Throw in the fact that Ulansey and HumCPR only came up with the idea about six weeks prior to eviction day and were hustling to throw it together on the fly — a process several compared to trying to build an airplane as it careened down the runway — and the idea seemed impossible to just about everyone. "People warned me that I'd get burned," Chinn says, adding that she said yes that first day because she couldn't believe the local business community wanted to do something for the homeless. She says she also saw it as an opportunity to both help people and come to the aid of her city. She never looked back. "This gives me more and more belief that God's guiding me, but I'm not some religious crazy," Chinn says. "Someone asked me why they don't see me at church. I said it's more important for me to be here than in church." It was a bold decision, but one that didn't surprise too many people around Chinn. "There is no great deed, and probably no good deed, in this world that doesn't require a certain amount of courage," says former District Attorney Paul Gallegos, who serves on the board of Chinn's foundation. "I think Betty's been doing bold things all along." If signing onto the container project was bold, it pales in comparison to a decision Chinn made some 10 months earlier. It was August of 2015 and Chinn was busily fundraising for the family shelter as a citywide focus on the PalCo Marsh escalated. While city government seemed in a tangle over what to do about encampments there, the police department was reporting an escalating lawlessness in the camps, with rampant drug use and violence. Against this backdrop, Chinn says she was approached by two men and a woman living in the greenbelt behind the Bayshore Mall. "They said they didn't feel safe in the marsh," Chinn says. About five years earlier, Chinn had connected with a local property owner with a plot of land in the hills who'd told her she was free to use the property in the future if she needed it. Chinn hatched a plan and soon relocated more than 100 people to a private sanctuary camp in the hills, outfitting each of them with a brand new tent. As Chinn recounts the story, she's interrupted with a question: How did she get more than 100 people from the marsh to the property in the hills? "In my car," she says, explaining that she spent almost an entire day driving back and forth. As the only attorney on Chinn's board, Gallegos is generally tasked with trying to limit her exposure to liability. One could say it's nearly impossible. "Betty's less risk averse than many," Gallegos says. "She's not looking at newspapers or blogs to see what they're saying about her. She does what she knows is right. So, there came a point where it was just, 'Well, I guess we're doing this.'" But Chinn also doesn't do things without thinking them through and her sanctuary camp is a good example. Once she identified the group of people who wanted to move from the marsh, she selected 18 of them to take on leadership roles. She had each of them stay for two weeks with someone whom Chinn had recently helped move into housing, feeling it was important that they break away from their "homeless mindset." After two weeks, she moved 16 of them up to the property in the hills to stay there alone for a week and get situated (two of the original 18 decided they weren't ready to take on the task). The 16 helped get the property set up and met with the landowner, who had portable toilets and showers moved to the area. Then Betty relocated the rest of her camp up to the hills, asking each person four questions: why they wanted to leave, what goals they had, what they were willing and able to contribute to the camp, and where they ultimately wanted to go. Chinn then spent the ensuing months overseeing the camp. She paid daily visits to drop off food and shuttle people to and from job interviews and housing appointments. Many in the camp — 38, at the final tally — decided they wanted to return to their home communities outside of Humboldt County and Chinn says she facilitated that, reaching out to family members when possible and connecting with shelters and homeless services providers when it wasn't. Chinn says it was important to her that if she was sending people out of town, there would be someone there to receive them when they got off the bus. "I told them, 'If it doesn't work out, send them back. I'll pay for the ticket,'" Chinn says, adding that she regularly called to check up on those who relocated. As for those three dozen bus tickets, Chinn says the landowner — who she promised not to identify publicly — paid for them all. In February, Chinn says the camp wrapped up with its last couple residents relocating. In all, she says 68 people found jobs, pooled their resources, and entered permanent housing. When you talk to those around Chinn about her sanctuary camp, what seems to impress them most isn't that she did it or that it worked, it's that she did it while still doing everything else she does. That includes ferrying about 20 homeless kids to the shower facility every morning and then dropping them at school, feeding hundreds of people daily and running her center. "Betty doesn't rest," says retired Eureka City Manager David Tyson, who's spent the last three years serving as treasurer of Chinn's foundation. Back in the lot at Commercial and Third, as one resident strolls by with her dog on leash and another works on fixing up an old bicycle, Chinn mentions casually that she was talking to President Obama recently, telling him about the improbable success of her shipping container community. Chinn says the president was nostalgic, talking about watching his two daughters grow into young women during their time in the White House and comparing that with the growth he's seen in Chinn. Six years have now passed since Obama bestowed Chinn with the second highest honor in the United States. In that period, Chinn has formed a nonprofit with a powerhouse board of directors that, in addition to Tyson and Gallegos, includes retired Humboldt State University President Rollin Richmond, local developer Kurt Kramer, Mercer-Fraser Co. owner Justin Zabel and Eureka First Presbyterian Church Pastor Dan Price. 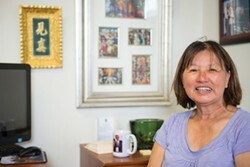 She teamed up with Catholic Charities to open the Betty Kwan Chinn Day Center, which over the past year helped find housing for 52 people and employment for 95 more, according to Program Manager Theresa Hessian. The center's Bridges After School Program offered educational programing and support to up to 25 homeless children daily, and the center also held bi-weekly health and wellness programs for 20 children — offering everything from yoga to dental health. Then there's the center's foster care respite program — which takes in 15 to 30 children one night a month, giving foster parents a much needed break — and a summer program that offers homeless children some stability while school isn't in session. And this Friday, Sept. 16, Chinn will officially open her new family shelter. Standing on the second floor of the newly renovated building on a recent afternoon, with the smell of fresh paint still hanging in the air, Chinn says she's been overwhelmed by the community support for the project. Volunteers came in to paint, Kramer has donated countless hours of work, the Eureka High School football team came in to rip out the old carpets, the list goes on. As she gives the Journal a brief tour of the place, a volunteer is busy laying linoleum on the stairs. The new shelter will house 14 families upstairs, providing small living quarters and case management as clients and their children connect with the programming at the day center next door. Downstairs, Chinn says there's room for 10 homeless people recently discharged from the hospital to convalesce in a clean, safe space under a partnership with St. Joseph Hospital, which has put forward some funding and will staff the downstairs with 24-7 caregivers. It's also warrants noting that some degree of public outcry has met just about every one of Chinn's projects. When she opened the shower facility in 2010, people said it would be trashed in a matter of weeks. It wasn't and, six years later, still hasn't been. When she announced plans for the day center in 2013, some business owners in the area expressed fears that the neighborhood would be enveloped in crime and overrun with homeless people loitering on the sidewalk. That hasn't happened, according to the Eureka Police Department, which is headquartered just a few doors down from the center. Perhaps the loudest concerns were voiced by business and property owners around the container project, who threatened to file a lawsuit and relocate their businesses outside city limits if the city council approved the project. Four months later, attorney Andrew Stunich, who's representing a group of unnamed property owners, says only that he's taking a "wait-and-see approach" to what happens at Third and Commercial. Eureka Police Chief Andrew Mills, meanwhile, says the project has worked out better than anyone could have expected, noting that he doesn't blame the container project for any issues in the neighborhood. While Chinn hasn't let any of these outcries derail or change her plans, she clearly hears them. For the first few weeks after the container project opened, Chinn spent her nights sleeping in her car outside the gates, just far enough away so as to not make residents feel like she was keeping watch, but close enough to see first-hand if there were any problems. Inside one of the portable toilets on the project, someone has affixed a three-word sign: "Prove Them Wrong." As Chinn and Rockwell, the program manager, sit chatting at a picnic table, a large bearded man rides up on a bicycle and waves over the fence to say hello. Chinn enforces a strict tenants-only policy at the project, noting that former residents aren't even welcome back inside once they've moved up and out. This particular guy, Chinn says, was living in the marsh despite receiving $2,200 a month from a family trust. He's now one of the 34 people the project has transitioned into housing, but he still swings by daily to say hello over the fence. Chinn says it's been incredible to see people transform at the project and the way the community has gotten behind it. She points out that Friends of the Marsh, a group of volunteers who provide supplies, food and water to people living in the PalCo Marsh, come by every Tuesday to provide laundry services. A licensed social worker has volunteered his time to offer counseling services, and a handful of local businesses have stepped to the plate to employ residents. Meanwhile, project staff — Rockwell and Stentzel — are working seamlessly with county services. Humboldt County Department of Health and Human Services Director Connie Beck, who describes the entire project as a "great success," says this might be the most impactful part. She says the county has a clinician and a case manager down there daily helping DHHS clients and others access services. "We've worked with Betty and her staff before, but this is the closest we've ever worked and probably the best connection we've ever had," she says. Rockwell say the county has also made Street Outreach Services completely available to the project, which relies heavily on it to pick up clients and drive them all over town, to doctors and dentist appointments, job interviews and classes. For Rockwell and Stentzel, the project has also been a wonderful training ground, a place where they can put their masters degrees in social work to work in an innovative program. "It's been phenomenal," Rockwell says, adding that the project has used trauma-informed principles to help people stabilize and take steps toward improving their lives. To hear Rockwell tell it, he and Stengel spend their time coordinating clients' appointments and transportation, mediating and de-escalating conflicts, and helping clients navigate the endless hoops to get them identification, Social Security cards and birth certificates — things that are often large barriers to accessing services. But with the harm reduction model the program is based on, Rockwell says the pair spends their time building relationships with the clients and acting as firm supporters. "We're not here to make friendships, we're here to support them and sometimes that means pushing," he says, adding that this is an area where Chinn excels. "I've been really impressed with her ability to know when to make that call, that hard decision to press people." And for many clients, the fear of failure or the resignation to a life of homelessness is the single largest barrier. "For so many, that spark of hope is nonexistent," Rockwell says. "They've been downtrodden so long. ... Often, our role is just to say, 'I know you think this can't happen but I do, so let's just take that first step and see.'" As Rockwell talks, the Greater Eureka Community Outreach Project board, which comprises both Chinn's board of directors and HumCPR's, is meeting nearby, weighing whether to send out eviction notices to tenants. Put together in a hurry, the container project was billed as a temporary solution to the marsh evictions and Chinn and others promised neighbors of the lot on Third and Commercial that it would span just six months. With Nov. 2 just weeks away, there's a pressing concern over what's next and how to prepare clients for whatever it is. The project needs a new site, someplace with running water and electricity, and about $150,000 in funding to carry on for another year. As the Journal headed to press, neither had been confirmed. But Eureka City Manager Greg Sparks says some things are coming together and he hopes to have an agenda item before the city council in the coming weeks so the city can weigh whether to offer up one of its properties and devote a portion of its housing successor funds — which he says currently total about $350,000 — to keep the project going. While Beck thinks highly of the project, she says DHHS doesn't have a funding stream for housing people who aren't DHHS clients and the county doesn't own any properties it can offer up, adding that the containers aren't ADA accessible, which is a problem for the county. "Those are barriers for us," she says. The future remains uncertain, but all involved seem hopeful — and generally optimistic — that the project will continue at a new site come November. Tyson, the treasurer for Chinn's foundation, says he's constantly concerned about how to keep all of Chinn's programs and projects funded. 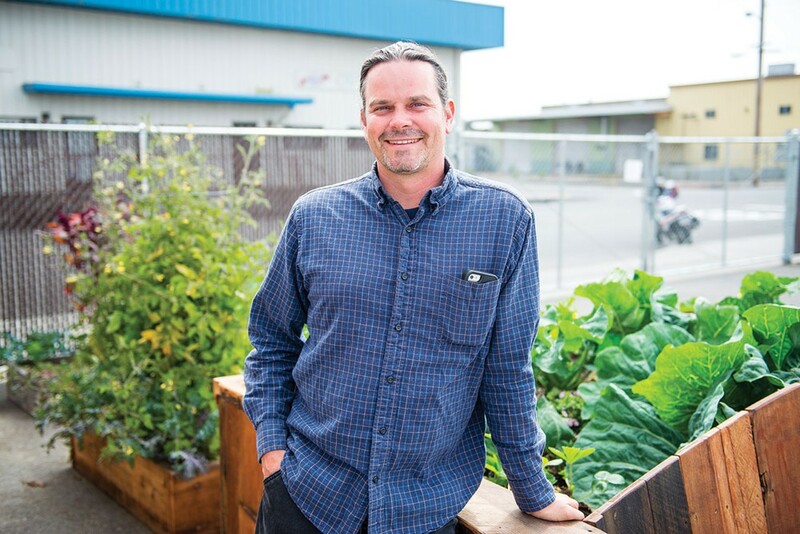 The family shelter will open with three years of operational funding, but the day center, and now the container project, are very much living hand-to-mouth, squeaking by from one funding cycle to the next. "Our community is and has been very generous ... amazing," he says. Nonetheless, he says, funding is a near constant concern. Between her sanctuary camp, the day center and the container project, Chinn has helped find housing for 155 people over the past 13 months. It's an extraordinary feat, but many around her worry about how long she can keep doing all she does at this pace. For his part, Gallegos said he'd like to see the community embody Chinn's spirit, pointing out that if every adult in the county put in an hour of volunteer work this year, that would be nearly 108,000 hours of work. If they donated a dollar a month, that would be $1.29 million. "We all want to have a world where everything is pretty and easy, but that world doesn't exist," he says. "We treat homeless people worse than we'd treat a dog. Would someone let a stray dog lie out in the street wet and hungry? We do it with people every day. ... Betty's not going to be here forever. The question is, what are we going to do as a community when she can no longer carry us all?" For her part, Chinn seems undaunted. She says she just wants a new home for the neighborhood she's helped to create, an opportunity to keep forging connections and pushing people to be their best selves, to help people develop the the tools and the courage to take that next step, no matter how small it may be. As the morning fog breaks and the sun shines down on Blue Angel Village, Chinn stands up from the picnic table and stretches her balky back, stands unsteadily for a moment and then walks with a slight limp to her truck that's parked a few feet away. The interview is over. "Got to keep moving," she says.